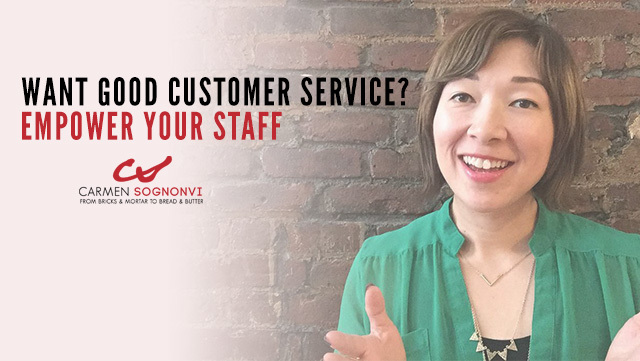 Delivering good customer service isn’t just about training your staff properly. It’s about empowering them with the systems they need. Do you wish your staff delivered better customer service? I recently got an email from a viewer who is struggling with that exact question. Keep watching to find out what advice I have for her. By the way, if you want to get a list of all the of the tools I use to run the marketing in my own business, head on over to Carmensognovi.com/tools. I’ll share with you everything from who we use for graphic design and printing, and I’ll even tell you about an app you can use to track that your flyers are being distributed the right way. I opened a jewelry business 5 years ago. The thing that I struggle with the most is motivating staff to become more self sufficient. I want them to think outside the box, and I want to encourage them to provide the best customer service possible. How can I do that? So, Alice, customer service is definitely one of those things that a lot of business owners struggle with, and I think that one of the common misconceptions is that its all about training, right? People think that if you train your staff properly, then you’re going to deliver better customer service and that’s actually just not enough. So in this video I’m going to break down three things that you should implement in your business to empower your staff to be able to deliver the kind of service that you’re looking for. You may have heard about this, but the Ritz Carlton hotel, chain, which is probably the best hotel chains in the world, they have a really interesting policy which is they empower every single employee on their staff to be able to spend up to 2,000 to make a customer happy. They don’t have to get permission. They wont get in trouble by doing it. They are automatically given the authority to spend up to 2,000 if they feel like it’s going to contribute to a better experience for a customer. That’s what I mean by customer happiness allowance. So think about how to implement this in your business. The dollar amount may be different for you. It may be lower. It may even be higher. Who knows? You may own a jewelry business. But the key is to think about whether it makes sense to empower your employees to be able to spend up to a certain amount of money as long as they feel that’s going to help improve the experience that a customer is having. So there’s a great book by Sam Carpenter called Work The System. I’m going to link it below. I would definitely encourage you to check out that book. Basically, Carpenter argues that you need to think about your business as a series of systems and every system should have a written documentation of how things are done, which basically are standard operating procedures. Some people call it SOPS for short. And so think about in your business, you want to standardize the way things are done. They probably are somewhat standardized already, right? I’m sure you have a certain way that you expect people to answer the phone. I’m sure that if someone comes in looking for an engagement ring, there’s a certain process that you go through in order to determine which rings to show to that customer. But, in many businesses, these processes and systems are not actually documented. So what you want to ideally get to, and this is something I’m working on in my own business, is document every single process in every single system. Now, this doesn’t have to be something that you do yourself. You can actually have your tean members start documenting the processes that they use on a regular basis in their own positions. So, you are all working together to create the standard operating procedures. Now, why would this help with customer service? Well, for one thing, it would standardize the experience that customers have so no one is free styling and doing their own thing. Everyone is clear on exactly how things are supposed to be done. At first you may think this seems very restrictive on the employees- that we’re forcing them to do everything a certain way. But actually Carpenter argues that the opposite is true. Employees find that this is actually very freeing. and the reason this is freeing is because if they follow the process and there is still a bad repercussion then the problem is with the system and not with the employee. So it really takes that blame factor out of it and it really focuses everyone on thinking ok how can we prevent this mistake from happening again in the future? There must be something we need to improve in our system or in our process and so that really takes the personal blame out of the matter and everyone’s focused on making the organization better as a whole. In your business you probably have a certain set of values that you go by, right? Whether it is personal beliefs or the way you operate as a company, there’s probably a set of values and by values I don’t mean scripts and procedures on how to do certain things. I mean, generally overriding principles and values that you guys really believe in. But, are those written down? If not, you should really think of boiling those down into 3 to 5, no more than 10, core values that really represent what your brand and your company stands for. And the reason this is important and the way it ties back to customer service is there will be situations where your employees are dealing with a circumstance that hasn’t been planned for. That they haven’t been trained in, that you guys haven’t set up a system yet. And now they need to make a decision as to how they handle that situation. the right decision because they can think to themselves, “Ok I’ve got options a, b, and c in terms of ways I can respond to this situation.” Which are the ways that would align most with our values? Which of them would really communicate what we stand for? You know, what would my boss do in this situation, based on the values that I know she holds? So that’s why the core values document is really important and one that you should definitely implement. Ok, it’s time for some shout outs and this time I’m actually going to be shouting out some of my instagram followers who were kind enough to leave comments on some of my recent posts. So, if you are not already following me on instagram, be sure to do that. I’m @carmensognovi. So, I want to send shout outs to the spasb, to mikellan19, to doctorlovejones and the imagination spot. I thank all of you for your lovely comments. I’ve linked up to you guys below so the rest of you, make sure you check them out. Thanks for watching! Carmen Sognonvi is the founder of Top Flight Family, the essential resource on luxury family travel. A seasoned media professional in both digital and print media, Carmen Sognonvi began her career in the advertising departments of Surface magazine and Town & Country magazine. Carmen lives in Brooklyn, NY with her husband and two daughters. © Copyright 2011-2019 Carmen Sognonvi.